Could the Iran Deal Lead to an Economic Windfall? We will have more trade; we will have less United States interference in our trade with other countries. Iran is a huge investment opportunity, and the human resources in Iran are probably second to none in this region. The pool of educated, serious, hardworking labor force in Iran is probably the best in the region. … This is the most stable place in the neighborhood. So it is an opportunity. A lot of people are already interested to come to Iran. Even if all goes according to plan, the US and EU won’t lift sanctions on Iran until 2016 at the earliest. Once that happens, Iran can finally start selling some of the roughly 30 to 37 million barrels of oil it currently has stored in vast floating tankers off its coast. That could push down, modestly, on oil prices. But after that, it might take years for Iran to get production in its crippled oil fields back to pre-sanctions levels. The country does possess vast crude reserves — but that doesn’t mean it’s all coming online tomorrow. It is the world’s largest exporter of cement, as well as pistachios, saffron and caviar. Shipping is another big earner. State-owned Iran Shipping Lines has been badly hit by sanctions and stands to benefit significantly when they go, analysts say. Yet interest from European countries has grown “exponentially” since the interim nuclear agreement was signed in Lausanne in April. 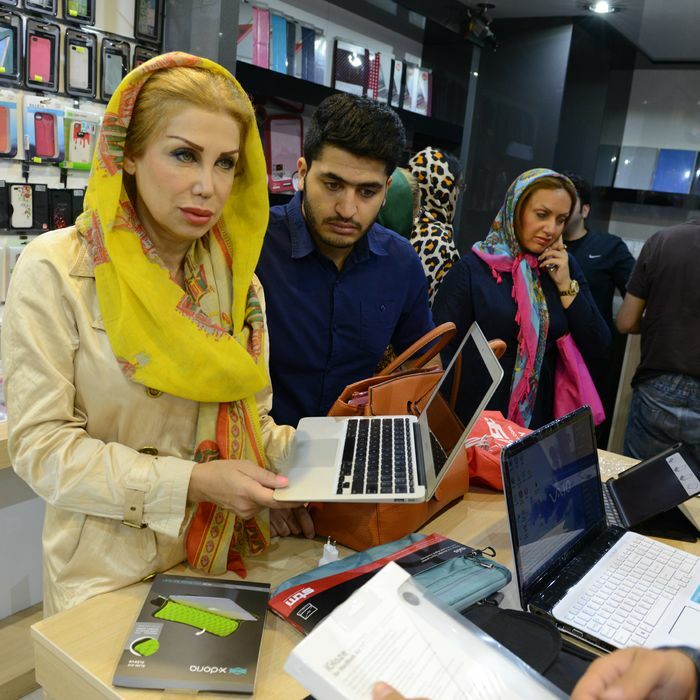 Iran’s financial sector, food and beauty products are of special interest, he added. And French investors are looking closely at investment in hotels in the expectation of a leap forward in tourism. Due to decades of pent-up consumer demand, post-sanctions Iran will become a major emerging market for foreign exporters catering to luxury markets such as high fashion, fast cars, and the latest techniques in cosmetic surgery. Foreign suppliers will find lucrative sales markets in the hitherto moribund pharmaceutical, information technology, and aviation sectors (aircraft average age is 35 years and airport equipment dates from the 1970s). Educational collaborations will spring up with American and European universities – as currently seen in the United Arab Emirates and Saudi Arabia – catering to Iran’s talented and discontent youth. Though it has had business and political relations with Europe, the Islamic ideology of Iran’s leadership has always kept Western countries at arm’s length. In recent years, hard-liners have come to play a key role in some of the country’s biggest industries, like energy and telecommunications. The Revolutionary Guard, the arm of Iran’s military charged with protecting its Islamic system, is likely to remain under sanctions for alleged terrorism and human-rights violations. That could pose a risk for companies eager to enter businesses where local partners, or even conducting standard transactions, could trigger scrutiny from Washington or European capitals. And looking at other business opportunities within Iran, other issues arise. For instance, Apple apparently put plans to move into the market on hold once they found Iran’s laws regarding user agreements too restrictive. And Boeing, once it was allowed to do so last year, tried to sell airplane parts to Iran, yet despite the country’s desperate need for those goods, the two sides could not come to an agreement. The aircraft giant will surely have another go at doing business with the country if the deal goes through and it is allowed to sell whole airplanes this time around. Finally, while Iran may be a big, complicated market with lots of money to spend as a whole, the country has also faced years of worsening economic hardship for many of its ordinary citizens, and as the L.A. Times reports, “Iranians struggling through double-digit unemployment, high inflation and 1 in 5 families living below the poverty line” are hoping that any windfall from foreign investment will help improve their lives as well. Could the Iran Deal Lead to Economic Windfall?